Following up the successful 2016 Summer League Campaign, here is our complete report on the 2016-17 Winter League Campaign, based on 18 different top flight leagues. We will try to avoid repeating what was said in the summer league article so that it is all new information for you here. For the sake of completeness, you should still read and digest both reports for a full idea of our strategies and thought processes. And you will find the current stock of available HDAFU tables via this link. Before beginning to plan any portfolio or placing bets, you will need to review your analyses and rank the systems you have found according to risk exposure based on the values of the upper inflection point odds. This will allow you to compile a portfolio with a healthy balance of risk, which is essential to the success of any investment plan. You will also need a definitive framework to be able to judge the final results. Systems that achieve a six-season-high (i.e. profits larger than any of the previous five seasons). (Over-Achievers). Those that make a profit over and above the size of the initial stake (£100 in our case), but fall short of six-season-high results. (Achievers). Strategies that break-even or, record a tiny profit or loss up to the size of the initial stake (£100 in our case). (Zero-Sum). Leagues that make a loss over and above the size of the initial stake. (Losers). You can already see that two of these outcomes are favourable, one is neutral, and only one is detrimental. Only eight of 28 bets won, but this was enough to see a profit of £882.00. Hit rate and yield were both below the calculated averages and the resultant profit figure was lower than any of the five previous seasons’ figures. Both the estimated hit rate (33 out of 97 bets won) and yield figures were surpassed by wide margins, leading to a six-season-high profit figure of £3,108.00. Nine out of 22 bets won, and whilst the hit rate and yield both outstripped expectations, the profit figure settled at £1,247.00, the fourth largest in the last six seasons. This one suffered its worst result in the last six seasons, but the resultant loss was minimal at -£310.00. This was the only system employed in this league purely because the format of the second half of the 2016-17 season was to change from previous seasons. Although hit rate and yield were both below estimates, the system still recorded its third highest total for six seasons at £1,238.00. There were twice as many bets than expected (largely due to the fact that around 40% more games than usual were played in the first half of the season to accommodate the new second half season format). This system suffered the longest losing streak we have ever encountered, almost 14% worse than expected, for a very painful 36 straight losses. (A six-season-low). However, the situation was mostly recovered by three big winners all carrying odds of over 12.00, for a final loss of just -£32.00. The last six bets of the season lost, but had only one of these been a winner, this system would have returned a profit. Small margins. Hit rate and yield were both below par, but the league turned in a steady performance for a profit of £1,634.00, ranked fifth largest in the last six seasons. The same story as France Ligue 1, but with a profit of £2,801.00, for its third largest profit figure in six seasons. This one was unusual for a much higher number of bets than expected. (215 vs. 119 estimate – Profit was at £2,523.00 after 119 bets). Another below par system, but one that still achieved a profit of £1,098.00. (Fourth largest in six seasons). The very rare inclusion of a system with two non-profitable seasons (the oldest two) in the previous five. It featured one more bet than expected, which won, to total one more winner than expected. Hit rate and yield both exceeded estimates for a profit of £1,294.00. (Fourth largest in six seasons). The hit rate here was almost 8% below estimate and resulted in the worst performance for six seasons, and a loss of -£819.00. I have seen so many of you experiencing different runs of fortune this season; many of you communicate with me via private mail and many of you post your experiences on the blog. Firstly, therefore, thank you for even bothering with our website. We are always very humbled by the support. Although I can’t share anyone’s individual paths, what I can say is that the raft of results vary from exceptional (several better than our own) all the way through to pretty disastrous. In addition to these fundamental differences there are many more variables such as missed bet opportunities, lack of consistency with the timings of bets, and personal traits such as greed in waiting for higher prices to appear before committing to the bet, or even hesitancy in not being confident enough to place the bets because ‘common sense’ dictates otherwise. Whatever the differences between you all, whilst it is nice to encourage each other when things are going well and commiserate when things are failing, please all be aware that you are indeed all different. When you begin to compare results with each other, please, please always have in the back of your mind that your are effectively comparing apples with pears, and don’t draw too many conclusions from someone else’s experiences. Your results and, more importantly, how you come by them, will bear little resemblance to each other. This is important to remember, and appreciating this fact will go a long way to understanding that ‘herd mentality’ is exactly what the bookmakers thrive on. I do feel genuinely very sorry and remorseful for those who have bad weeks, and happy (and sometimes even justified!) when reports are received of roaring successes. And like a standard distribution curve, we receive equal numbers of both. Personally speaking, we have been using this systematic betting approach for several years in both full-term market and in-play trading scenarios. a) Size matters! The larger portfolio the better. b) Portfolio balance matters! A balanced range of bets from low-low/medium-medium-medium/high-high is essential. c) Bank roll management is crucial. protect what you have and speculate when you can. Perfecting the other necessary cosmetic details such as identifying bet placements, persevering through crises, monitoring results, checking everything, adjusting attitudes, and so on, is a very personal thing. I can tell you that what works for one will be unpalatable to another. You must find your own balances here. And lastly, there are two types of mistakes: good mistakes (lucky wins), and bad mistakes (uneducated losses). But you must always be in a position to recognise mistakes (whether good or bad) as mistakes whenever you make them. Write them down. Post them in front of your screen. And try very hard not to repeat them. So as it stands, even though the performance is below the average of the last 5 seasons, the whole thing is in profit. I regret not sticking with this and carrying on placing bets, as if I had done so, I would have recouped losses and got back in profit. Live and learn as they say. Still, a lot can happen, this season from now until the end. But I just wanted to report the period of success and to say that long term, this is working out as planned. Summer leagues start this weekend with Ireland, so I plan to begin a fresh campaign with real wagers then. After a glimpse of hope at the end of 1st half that statistics finally settled in and recovering from losses well, I finished my 6th losing week in a row today. The hit rate was 16%. I sincerely hope I will stop chasing Simon’s “achievement” of 11 losing weeks in a row now. The campaign came back to its usual performance: 1, maximum 2 wins and then normally a losing streak of at least 4 bets, but just 4 is like a dream, normally it’s 5-12. When portfolio performs like this, no bank management will save your bank, it will just go bust later. When balance goes up, ratchet-stop loss mechanism should work well to get the most out of what you do, but when it goes down, I find it detrimental. You may bet 100 units, suffer losses, then reduce the stake to say 90, and if you win, you recover from losses by betting just 90 units, not 100. Then, if you’re lucky to win enough, you increase your stakes again to 95 or whatever and then you lose again at those higher stakes. It complicates recovery of a bank. I ran simulations and that’s exactly what is going on when portfolio fails to perform how it should for prolonged periods of time and the way losing weeks exchange with winning ones. It has 4 months to go, 5 months are gone, 785 or 60% bets placed out of 1307 estimated. I won just 224 or 28.54% of my bets. Expected hit rate is 40.93%. The hit rate is lower by 12.39%. With this kind of deviation against me, portfolio is going to fail and ratchet-stop loss mechanism would make it fail even worse. Even though it’s really unlikely all strategies will fail, it’s little consolation for us. It doesn’t matter if all systems fail and lose 10000, or 9 systems win 10000 and the 10th system lose 20000 units. It’s incredibly tough to cope with after successful summer season. It’s weird because I’ve found the opposite has happened. Mine has actually started (I hope!) to settle in to normal performance. I’ve had a few strategy changes as we’ve moved into H2 of the season, but even some of the strategies which were catastrophic in H1 have now sorted their lives out and are making money. January brought 28.5 points worth of profit – a pretty crazy month! I’m prepared for more variance between now and the end of the season, but hopefully on a more measured basis than we saw in the first half of the season. Please don’t replicate my run of 11 losing weeks in a row! That was most certainly a brutal run of bets. After the 11 week losing run, I stopped placing real bets and went into observation mode, but as my luck would have it, the entire portfolio recovered and ended the 1st half of the season in profit. Not a fortune, but 12 times the stake size, so it was something. As for now I’m just paper testing the remainder of the winter leagues and seeing what happens, and using it as a learning experience. I hope yours is profitable for you. You raised the point about the ratchet and stop loss mechanism. In my winter campaign I did eventually employ a stop loss, but not right away. Having said that, I kept 2 separate records: 1) Flat stakes for every bet, 2) Reduced stakes via stop loss. Interestingly there was not much difference at all in the bottom line when comparing both methods of staking. I’m basing that on losing less per losing bet, but winning less per winning went, so balancing out somewhat. Definitely the ratchet is great when on a long winning run as you really can make the most of winning bets with larger stakes. Its the long and protracted losing streaks that will be detrimental. Winnings will disappear fast with larger stakes. The effect of my losing streak on the bottom line of profit/loss was mitigated by the fact that the losing run occurred at the point when I had accrued 24 points of profit. After 11 weeks of losing I was at -30 points of profit. So that’s a 54 point swing, and in isolation, half of the bankroll. In real terms 30% of the bankroll. I mentioned it before in a post of mine, that my belief is that if the system or group of systems are all viable, then flat staking will produce a profit. My system’s showed that to be the case after judging at the end of the betting period. It’s a shame that 2 of the 13 systems running (Spain, Turkey) suffered “Heavy” losses and really dented the final profit figure. Certainly for the 1st half of the season, there were bigger than expected deviations in the hit rate of some systems – which most of us have reported. I’m hoping the summer campaigns show a little more consistency! I also have these and they are all at pretty big loss. How can this be? Yes, no problem, I will get in touch with you on Monday. I noticed a while ago that if some of us make profit, then some of us suffer losses. With probably none of us achieving any gains in profits in the long run. This weekend I finally broke my 6 weeks losing run and had a good weekend. 10 bets won out of 24, 41.66% hit rate. Even if all estimated bets lose up to Thursday I will still be in profit. However, it seems even with the supposed advantage against bookies not all of us will avoid portfolio failure. Having endured so much, it’s pain to read about someone else having another disastrous weekend. Scott, let us know how this weekend went for you? And Simon? I suffered small loss in Ligue 1 favourite, 1st half, Ekstraklasa dog, 1st half was pretty much the same profit as Simon’s. Rado, it’s strange you suffered loss in Ekstraklasa since it was very good performer with dogs, maybe it’s because the way you decide if the bet is valid or not? Although my difference with Simon’s Ligue 1 favourite is very big – about 700 units. 99% of time I rely on pinnacle odds only and I check them on pinnacle site, not oddsportal. 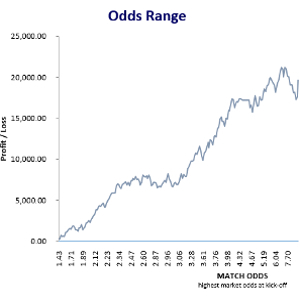 If the odds fall in the range, then I check other bookies for even higher odds and then place bets. Hi Jo – I had another good weekend. 8 points of profit. It started off poorly with Friday and Saturday both making a loss, but came storming back on Sunday. Belgian and Austrian draws both had a good weekend as did Italian favourites. Last minute drama in Monaco was a nice way to finish the weekend! I am completely devastated! After accumulating a nice profit in the last 2 months, the last 2 weeks destroyed everything. Over 20 stake units loss! All my profit is gone and now I am below zero balance… NONE of my last 10 bets won, and these were not only high odds, but also short priced favourite games… I don’t understand how can this be possible. About 80% of all my systems are 10-15% below the projected hitrate!!! Why? As you can see below from my results posted, in the 1st half of the season, I had some systems performing well, and some that were catastrophic and really dented the potential profits. I only had one system that I would classify as an over achiever – where the hit rate was way over what was expected. From looking at the hit rates of the achievers and zero sum systems, they were well below the average of the last 5 seasons. I think the low hit rates has really been the consistent factor that everyone has reported on that is stunting our gains. Nothing we can do to affect the results on the pitch, and we can’t stop a poor patch of results all coming at the same time. As mentioned I stopped placing real wagers at the start of November, and carried on paper testing. Many of my systems that were losing – remember I had 11 losing weeks in a row! – recovered in the final 2 months of the 1st half season. So it seems we can either have consistent results or long periods of good and bad, which will result in a very topsy turvy season. Rado, I had multiple losing streaks of 8,9,10 losses in a row and it was very disheartening to see the bank depleted. Sometimes I would have an 8 game losing streak, 1 win, and then 8 or 9 losses again….it is tough to handle for sure. I would much rather prefer a consistent run of results over a longer period of time rather than the topsy turvy nature of things many of us have seen….but that is not something we can control. Observing results and paper testing is much easier on the nerves for me at present, as this was my first time getting involved with something more in depth. What I have learned is that things can only be judged at the end of the specified betting period and until that time, managing the bankroll is the key thing. I lost money by getting panicked around november – when in hindsight I should have stuck it out and persevered. That was a valuable lesson learned for me. I will post a complete hitrate report for all 17 of my systems when the season is over. Then we will be able to analyze everything.